Robert Cornelius made the First Selfie in (1839), Basically it was a self-portrait and then in 2013 Oxford dictionary declared the name as Selfie which means “the picture taken of itself”. And Have A Nice Day…!! Selfie Drones are regular drone which has picture taking feature’s or maybe this feature installed in it for the selfie craze; it helps in making a picture of you, your group and any activity you are doing. Keeping the mind frame of Selfie there is a certain function which can see like, Facial Recognition, Beauty mode or even Altitude mode is present in it. It’s the most liked and preferred feature in any gadget today. As it’s operated through your smartphone via an app, this is easy to a user as the controller is at your fingertips. You can conveniently share the taken photos or video with your friends or on social media as well. Having invested in drones, you can save the cost of calling professional photographer at your events, i.e., birthday parties, holidays, picnics, camping, hiking, etc. by yourself clicking as many pictures and videos of HD quality as you want along with a professional quality camera of 4K. Usually, camera drones manufacturers claim 30 minutes of battery life or flight time, but that’s under ideal condition. The actual flight timing and battery life will vary on various factors which include the pressure of wind during flight, the speed at which it’s flying, etc. Drones operated through batteries which can cost you from 5-100$. It’s advisable to spend on extra batteries, or your drones might get crashed when it runs out of battery which will eventually charge you more on repairing cost. Apart from basic features offered in a drone, some automatic functions like, automatic face detection, follow me mode to focus your face from a front or to follow from behind, etc. You can’t ignore the fact that today privacy is not only a personal but also a safety issue. When you are flying done in your garden, backyard or any other place, people might not like it or think that you are spying or might take it as a threat. Another thing to keep in mind while flying is you should be good enough to handle your gadget as to avoid people from doubting your flying skills which will make them insecure and may think that your mishandling can hurt them. You also have to take care of the distance and height to keep and that you may not operate your drone camera in any not flying zone which can put you in any substantial trouble etc. BNF means Bind-n-Fly: these RTF drones with no radio controller but the receiver. However, you can buy a radio receiver separately. FPV mean the first-person view: this used for piloting, framing photo or video in the drones directly from a camera. FPS googles also worn by the user giving him an immersive experience. RTH means Return to home: the feature that allows a drone to get back to its starting point automatically, this is for safety. Follow me: it’s an interesting feature that enables drone to follow a subject by tracking it through GPS. The GPS signal emits from a mobile or remote control handled by topic, following him/them while moving, surfing, skiing, driving, etc. Gimbal: it’s the system through which camera is stabilized for explicit photos and videos when the drone is flying, having the fast moment or when winds are high. Headless mode: this mode will control the drone through remote stick for moving left right, backward or forward regardless of the fact where the face of a drone is. Commonly Used by beginners. We have chosen some of the top selfie drones as to assist in considering and buying one for you and have shared the details of them below. This drone is known as the professional drone as it takes the 4 k video and 12 MP still images. Able to fly up to 40 mph. 16 GB memory card installed inside it. With the help of a smartphone app, it can control easily. This is portable as well as the foldable quadcopter, and like its name, it’s a Pro device as it offers complete 4K HD video streaming of 1080 p with its 3-axis gimbal camera for a clear, smooth photos and video means it makes the most of each of its pixel. While being in air Mavic recognize your gesture to click a picture of professional touch. It has Tripod Mode in it which makes it move slow for taking the accurate picture. While being outdoor, its Flight Autonomy technology is one of its best feature which can detect an obstacle from the long distance of approx. 49 ft and avoid bumping into it by hovering with satellite positioning. Being indoor it uses its forward and downward sensors to drift. Mavic is an example of bid thing packet in the small package, it’s small and compact in size but have a capacity to flight for long 27 minutes at a distance of 13 kilometers and this is due to its motors of high power and efficiency. The battery takes about an hour or so to fully charge and the drone will land itself if its battery goes out of charge. It’s an obedient device too, to follow all your commands almost instantly whether it’s for being slow or fast. Additionally, Mavic pro comes with DJI wireless Goggles to make you experience sight like a birds eye and 32 MP Sphere Panoramas can view through it. The device is user-friendly even or beginners who are not or less familiar with the joystick, with Mavic’s TapFly you can precisely select your direction with just a tap for the smooth shooting of the video. Mavic is high performance and extremely portable device in spite of its small compact size it offers all great function be it, quality picture or shooting, flights timing, DJI Googles for pro sight, Tapfly etc. some people reported issues with its customer service and dim light may affect its image quality otherwise it’s all in one package. 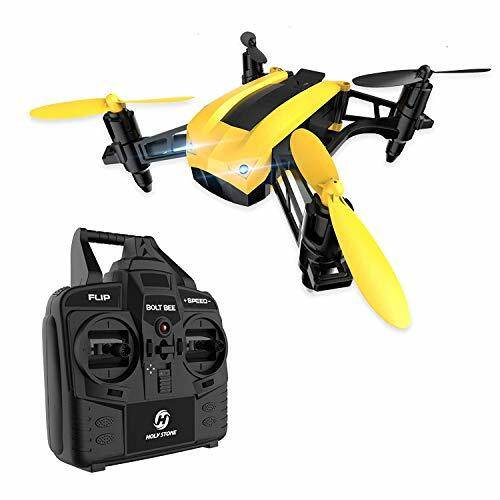 This 6-Axis Gyro quadcopter is designed for kid and beginners with a foldable feature, extra battery, HD 720p WIFI camera of 2.4 GHz for live video. A small, portable, foldable drone having flexible blades made with ABS plastic. Its blades are not only flexible but also foldable offering safety to drone while flying. Suitable for indoor as well as outdoor flying. The drone starts and lands with a single key providing ease for both newbies and experienced people. With an altitude mode, the drone is capable of maintaining a stable flight at height. It is having an adjustable HD 720p FPV WIFI camera for taking quality pictures and videos. The data through the camera can be stored in both App and on your mobile phone. A real-time transmission covering the range of 30 meters can experience when connected your drone to Wi-Fi via smartphone App. The system enables you to easily click, shoot and enjoy sharing the same. The drone package offers you a bonus battery along with a Modular one, both of which are both safe and powerful having 3.7V 500mAh, enabling prolonged flight timing for longer fun. The battery takes around an hour to fully charge and provide 7 to 9 minutes of play time. The headset can be connected to this drone for the more enhanced viewing experience. It has a gravity sensor mode in it offers you to handle it through your smartphone for directions easily and 4 high-low speed modes facilitating all its users. Night navigation light and remote-control indicator light both LEDs are also being provided in it assisting you during the darkness of light. The kit additionally includes a dust proof bag. Phone holder, USB charger. Extra landing pads and propellers. 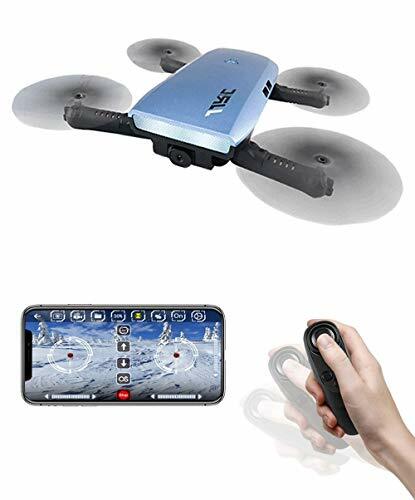 the drone with extra battery is surely a bonus in a completely affordable price, featuring G-sensors, foldable blades, a small and portable device which can be carried in a pocket. Suitable for both beginners and experienced users for using indoor as well as outdoor, live video transmission with quality and adjustable camera along with an option of sharing through your smartphone, combinedly is a good choice. It can use for kids and beginners. It gives HD quality picture. It has a bonus battery. Its flying timing is good. Sometimes its signal reception gets weak. One of the best selfies drones you might have heard about. It gives the HD quality picture and 1080P quality video, which gives an excellent look. Easily connected to Wi-Fi and can make the coverage up to 500 meters. Easy to use even for the beginners. The battery timing is excellent. It also has a strong GPS connection. Its body is made up of a good quality, but should be used with a lot of care Has a 2.4Ghz Remote Controller and it also has a 7.4V 1800mAh LIPO Battery. It has a home returning system fixed in it with the help of which they can cover the distance of up to 500 meters and still give the HD quality pictures or videos. A quadcopter featuring live video. designed with the latest brushless, this quadcopter is an efficient and durable device. This drone has a camera to capture live HD video with 1080 p. interestingly its 720p camera is capable of RTH, returning home within 500 meters of range in case it runs out of battery or loses signal and can shoot in wide angle of 120 degrees for quality photos and video. The drone is easy to fly for beginners as well as experienced people as it has only one key to lift, land, Altitude Hold and headless Mode along with IOC i.e. Intelligent orientation control for a smooth flight. The drone has a prolonged 30 minutes of flight timing (10-12 minutes on continuous flying). With ESC, electronic speed control you can increase the speed to fly along with the camera. Its built-in GPS signal ranges up to 0.6 miles and it offers the connectivity with Bugs 2 Wi-Fi via smartphone App, these bugs are capable to fly even in the darkness of night. However, you will need a micro SD card for recording video. 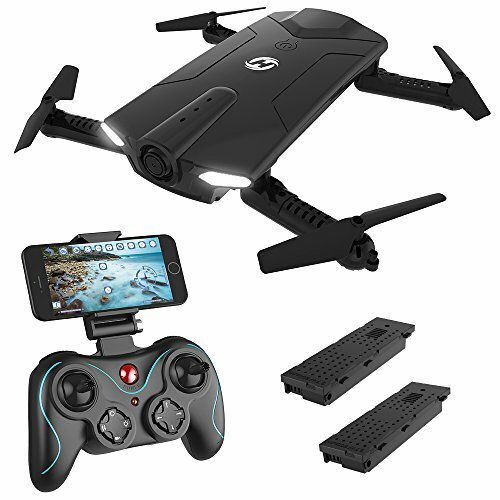 The package of force 1 Drone offers extra battery which is a plus, extra propellers, UL-Certified Balance Charger, smartphone mount and you can keep track of your camera activity with a remote control having LCD screen and two-way powerful connection and signals of 2.4Ghz. it even is able to flip 360 times. 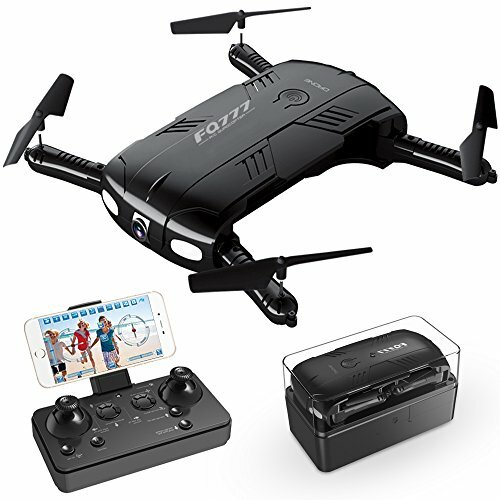 One of the best offers you get along with this Force 1 Drone is 100% refund in case it doesn’t please you with its performance, which is a great ease. Gives an HD quality image. Sometimes it doe has a strong connection with the wifi or GPS system get disturbed. Charging Time: Approximately 60 minutes. Control Distance: Approximately 197-262 feet(60-80 meters). Video Transmission Range: Approximately 98-131feet(30-40 meters). Here we came with the selfie drone review of our top most liked camera for all and that is RC Quadcopter pocket drone. It is one of the best and most demanded drones by a wide number of people. Don’t worry if you are a beginner as it is very easy to use with notes printed beside the buttons, providing directions. 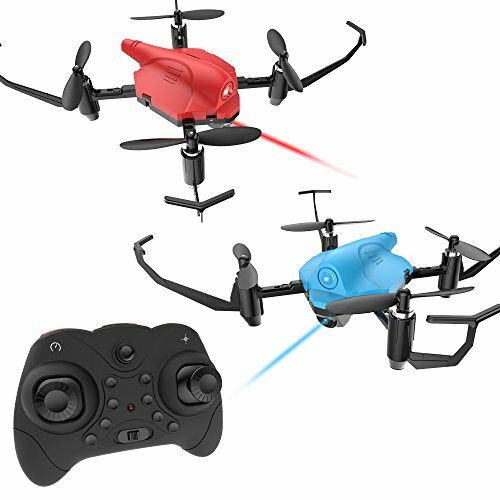 RC Quadcopter pocket drones come with an impressive flight time as each battery provides the additional 6-8 minutes for ultra-long flight time. With the help of first-person view Wi-Fi feature, you can see a live video feed of your flight on the iOS device and adjust the directions easy to take a picture or make videos. The most amazing feature mostly liked and demanded by every second person is one key return home and headless mode. By having this feature, you are relaxed even when the drone is out of sight as it will come back instantly with the simple click of a button. The headless mode keeps the drone-oriented in the pilot direction. It also possesses altitude hold function allowing you to release the throttle and keeps the drone hovering on its current height. The latest 2.4g technology used makes it possible to fly several drones at the same time without interference. More stability, easy handling, and 360-degree flips are obtained with the help of 6-axis gyro which is just outstanding. It is equipped with LED navigation lights for night use so, no matter whether you want to use it during the day or night. The packaging is pretty cool and compact. It is light and small. Each battery works for 9 to 10 minutes. The auto takes off and returns to home, features are awesome. Some people complain that the drone arrives late after order. This drone is also one of the most trending drones, they give a 720P HD quality Picture, and can take a clear picture from a 40 Meter distance. An excellent battery timing and that is about 45 min flying time of Gool RC T33 is 6-8 min. It has a wifi remote control device which means you can control this drone with the smart app. It has a headless mode which means it can easily rotate at 360 degrees. The Drone is a stable drone because of its construction. Has a Beauty mode through which the photos and video can make more beautiful. Because of its G-Sensor, it can easily control by moving the cell phone. Its battery should keep full care, it should not overcharge or keep at a high temperature. it should keep safe from the fire and water. Golic T33 is a portable pocket-sized, foldable drone that comes along HD camera of FPV 720P, Wi-Fi, and an extra battery. This RC model of a drone made for the people beyond 14 years of age in other cases an adult supervision is advisable. Its pincer-shaped is inspired by a crab, protects it against bumping and its made with ABS material for durability. The device completely portable with its arm designed which are foldable, making them half of its size. The arms will easily come out once you Tap its sides. The drone is also capable to flip and roll freely in 3 dimensions. 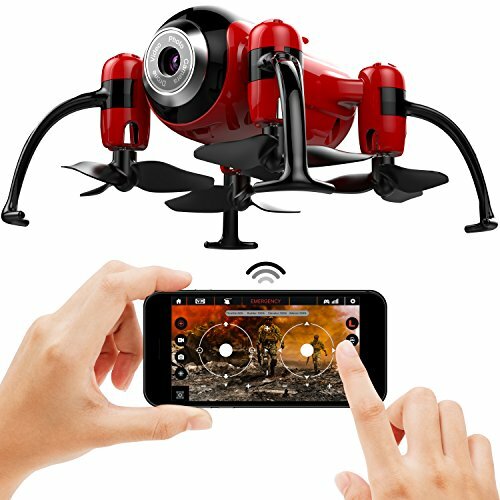 Selfie lovers will surely fascinate by this drone as it has a beauty mode enabled by the app to making your photos and videos more beautiful and making them come alive. Its headless mode offers you to have a good control over it keeping the drone in your desired direction. Due to the barometer sensor, it can keep a stable altitude and hover in the sky. The LED light lets you keep a track of drone during the night as well. Its flights’ timing isn’t so impressive and ranges between 6-8minutes, however, charging takes 45minutes. The manufacturer also offers to give you after sales customer service with 24 hours on contacting them. the drone is completely portable, lightweight and made of durable material, its crab-like structure and headless mode protect it against any damage during and while taking off. Controlled by an App through WIFI, you have an additional ease i.e. not having the remote to take care off. Moreover, its LED light, beauty mode, 3D flip, and roll are all great feature to fascinate any selfie lover. It has a 3D model. Controlled by a smart app. It can take picture from40 meter of distance. It has a wifi- remote control. It has a beauty mode installed. Sometime might give a problem in connecting to the wifi. Other than this there is not as such drawback. The RC Quadcopter is FPV, foldable, Wi-Fi camera featuring live video of 2.4G, LED night lights and more. 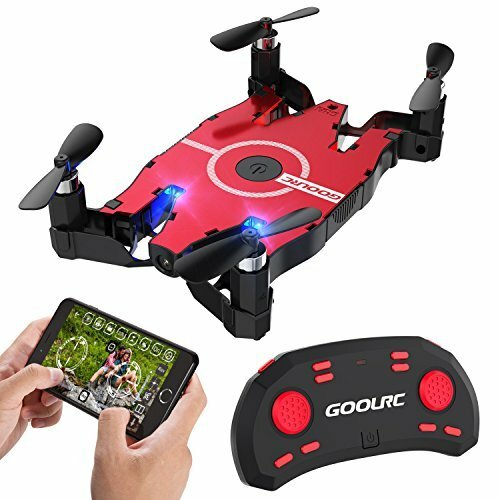 GoolRC T49 is super thin, the foldable drone with the mouse like and headless, gesture remote control which you can easily handle and operate. Its remote control is even thinner then drone itself i.e. 1.8cm. The drone has an automatic positioning system built in which can operate by just a return key i.e. by clicking the button the drone will come back to the location of the remote control. The remote control has 8 controlling buttons in it which includes, RTH, headless mode, Calibration, Left & right fine-tuning, backward & forward fine-tuning, high & low speed. Right shoulder button is for starting and stopping the flight, it is also used to switch off all motors of drone in urgency, while a left button on its shoulder is to control Flip and Roll modes. For real transmission 720p camera offered with the drone, the recorded photos and videos are saved through Wi-Fi in your smartphone memory. Beauty mode also offered. A playful function of 3D flip and roll at 360 degrees also featured in it, controlled by a single key even by the beginners. The drone a capability to automatically maintain its flight due to its barometer sensor. This will offer an extra ease to beginners as well. Additionally, LED lights are built in for night navigation, blue ones are in front while the red ones at the back. With 5 minutes flying time its built-in battery of 250MAH takes about 45 minutes to recharge and can control distance to the range of 30m. USB charging cable also included in the kit. The company also offers after sales customer services in case you face any problem while using it. You can contact them any time and your query will answer within24 hours viz e-mail and services will be provided on the earliest possible basis. 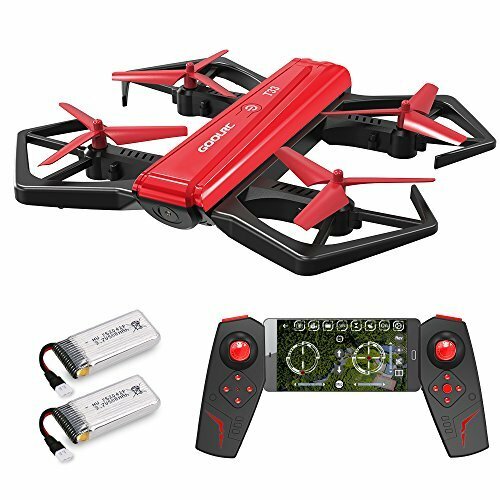 Apart from its battery life which is just 5 minutes, GoolRC T49 FPV Drone is ultra-thin, portable and foldable device, its remote with 8 buttons is even thinner and easy to handle and control, Wi-Fi camera for live transmission is offered with beatifying mode, barometer sensor, 3D flip and roll, and one key return all together makes a good deal of drone. It is unique in features. Gool RC T49 records live video. It has an altitude mode. This Drone can control by a wifi remote. One another product, Mini drone comes with so many of its attractive features in a market which fulfills the demands and needs of selfie lovers. It has altitude hold mode which keeps the drone locked at the certain height even if you release the throttle stick. This makes controlling the drone much easier and if you are a beginner, kid or using it for fun, you will love to use it. It also has options to change the operation speed and adjust it the way you feel comfortable. The one key taking off and landing feature is also an awesome, making drone easier to fly and control without worries. The pilot of this mini-drone doesn’t have to be worried about the direction as well, just activate the headless mode and enjoy making videos or capturing the beauty. There is out of range alarm as well to let you know when the drone is going to exceed the flight range, so as the alarm starts ringing so try your best to call back the drone else it will get lost. In the same way, there is low battery alarm as well, the transmitter reminds you by ringing that battery is about to die. Best both for indoor and outdoor use. It is durable with protected propellers. The build quality is so impressive. It is loved by everyone because of its features and design. It has a gravity sensor control. TeckEpic H47 drone has a live video feature inside it with the help of which you can see everything live on your mobile screen which is shown by the drone. It has altitude mode and a beauty mode and with the help of these 2 features, the drone takes stable and a clear image. It has a USB charger. Its arm can easily fold and after folding the arms it is safe to carry the device in the pocket. It has a headless mode with which it can rotate 360degreese. If you are a beginner then you should first read all instruction book. It has a warranty card as well. It has a good battery timing but you have to be careful with the battery that you should not overcharge it or keep it in water or fire. it has an excellent battery timing. It has a beauty mode as well. This Drone gives an HD clear image. There is no as such drawback for this product. Holystone HS177 RC comes with so many functions to capture the beauty of nature and share them with your friends. It provides you to perform outstanding actions and wonderful performance with 3D flips, supporting all rotations (forward, backward, right and left). By enabling altitude hold feature, it keeps hovering steadily at a certain height which makes it super easy to control for the beginners as well. Like other selfie drones described above it also possesses the headless function to keep you far away from the worry of the direction. The headless mode keeps the front same as the pilot is facing. Those who are choosy and not ready to have any color so good news for them as it comes in four different colors. So, you have the option to choose the one you like to have. It comes in three different speed modes to allow you to operate it in the speed which comforts you. There is an emergency stop feature as well, so if you feel that the drone is going to be out of sight so press the button to stop the drone immediately. There are three different speed modes for beginners and experts. Best pick for the beginners. This selfie drone is said to be the extremely fast one with high power motors for quick acceleration. You can achieve 50km/hr high speed in a few seconds. 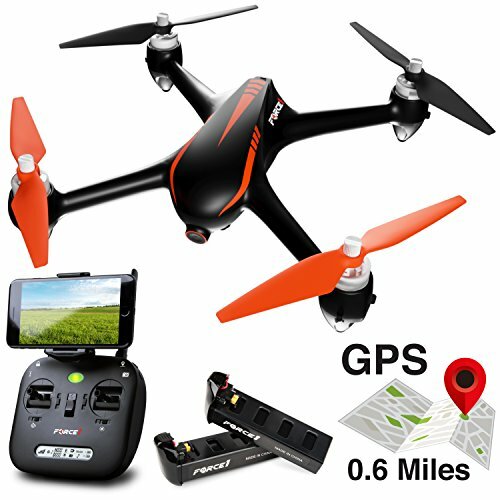 It is a great entry level racing drone, there to provide you with a wonderful experience. There is nothing to be worried about the flight time of the drone as it comes with 2PCS OF modular Li-Po Battery offering high performance. Its perfect 3D rolling allows you to implement various flight movements and continuous roll to let to capture the outstanding images. For the easiness of beginners, there is the headless mode to keep the orientation of the drone to the pilot. Its 2.4GHz 6 Axis Gyro Stability offers perfect stability and extends control distance for better handling. You can play several models at the same time without any interference. Holystone HS150 is durable with best build quality. Comes with 5 different speeds slow, fun, crash, crash hard, and AHH. 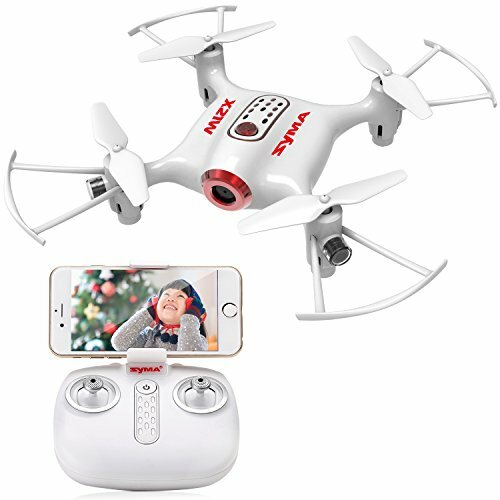 Taking HD videos has become very easy with the help of SYMA X21W MINI RC drone as it is equipped with HD cameras to capture the fantastic moments and make videos while flying. Beginners can use and control it without any difficulty as it is very user-friendly and easy to use. It possesses all in one feature like altitude hold, headless mode, one key backward, one key takeoff and landing making is the perfect one to use. Altitude hold allows you to keep drone at the same height even after releasing the throttle stick. With the help of headless mode, you don’t have to be worried about the direction of the drone. You can control this selfie drone with a smartphone app as well. So, if you want to use all functions such as Gravity sensor mode so you can download the app. The 6-axis gyro stability offers you more stability to handle 360 degree flips easily. Perfect for both beginners and experts. 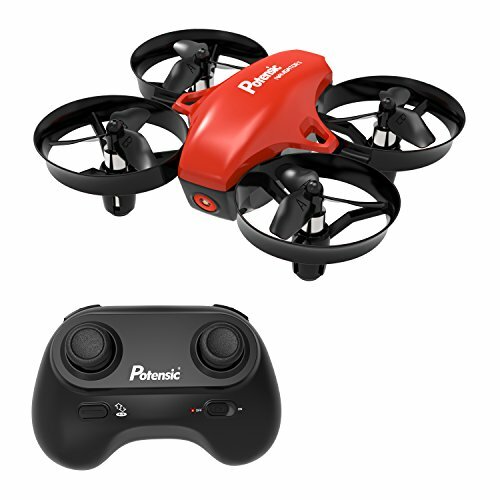 This micro-size drone is the perfect one for both kids and adults with the help of so many features available in it. Its auto takeoff and landing features make it quite easy to use and control. The altitude hold function allows you to capture the beauty by keeping it to hover in the certain height. The Fly Kolibri app allows the pilot for FPV drone control along with full 480p / 15 fps wide-angle lens captures live video streaming in real-time. You can see the live stream directly on your iPhone or Android smart device. By enabling headless mode without thinking about the direction as it will be the same as you are. If you are a beginner so this feature is best for you as it is designed to protect you and your selfie drone. In case of low battery, an audible alarm will start ringing to let you know about a dead battery and also if the drone is far from the transmitter, so the alarm will ring at that time as well. Now you have enough knowledge about Best Selfie drones, its basic terminologies and basic features for your understanding. And we have even given you our recommendations. The ball is in your court now to select the selfie drone best suited to your needs. Almost all above drone have great features to select them for. However, your budget, usage, and needs are the best judges to select one for you. 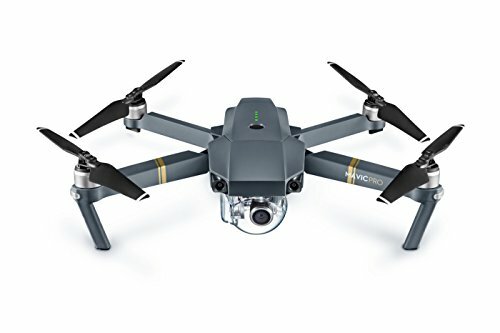 However, in all the above drones, our favorite is DJI Mavic Pro. The reason is not needed to mention as we already discussed all its features in details above. and storage options and especially the prolonged flight timing which confirmed by numerous users.